As my first fruit based sauce tested, this one certainly sets the bar high. 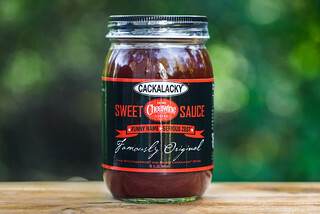 The bright and lively flavors given by an array of citrus fruits makes this a sauce that can add life to wide range of tasty animals from seafood to chicken to pork. 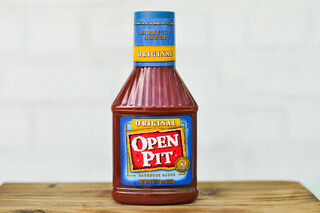 This sauce was sent to me courtesy of Lea Richards from the mail-order barbecue start-up Pig of the Month. A family who's vacations revolved around searching out the best barbecue, the Richard's have turned their passion and knowledge into their own barbecue business running out of Dayton, Ohio. 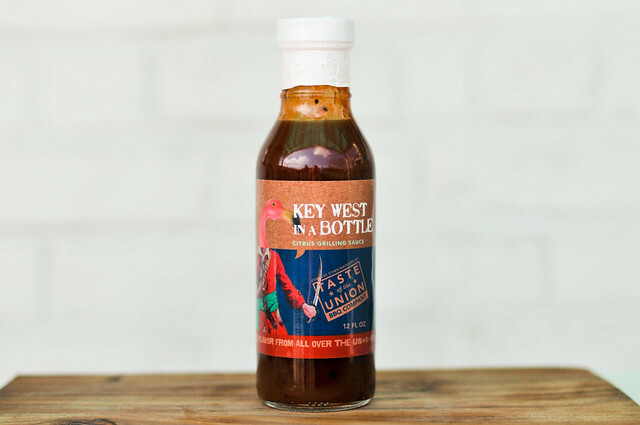 According to their website, this particular Key West in a Bottle sauce was born from a jellyfish sting in Key West, that brought an island native to the rescue, who later shared her barbecue that this sauce was inspired by. If a sauce was ever to be deemed "fruity," this would take top honors. Strongly mango, with hints of orange and pineapple, you'd be guessing this was more fruit salad than barbecue sauce if blindfolded. 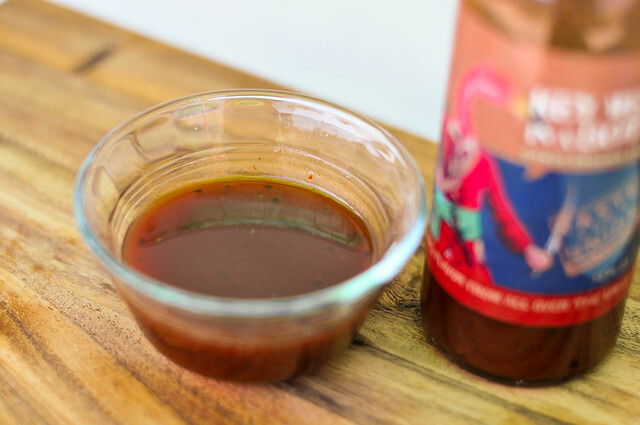 There are undertones of ketchup and some spice that does give it a little barbecue sauce definition, but boy, does that citrus blend make one fruity smelling sauce. Thin and drizzly, this translucent light red sauce lets you see all the specks of black pepper and what may be some fruity pulp. The first taste is big bowl of citrus sweetness. Mango is the most distinct flavor, with the other citrus fruits blending together. One reason it may be hard for me to pick out other fruits is because the sweet and fruity flavor pretty quickly starts to turn to into a solid heat. 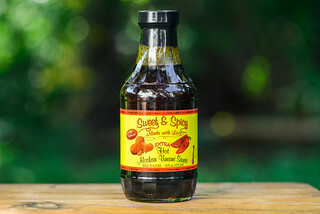 Black pepper gives a sharpness, while cayenne packs a punch that leaves a lingering burn that can only be undone by the initial sweetness of a another spoonful, which is a good thing. The thin sauce translated to a fairly thin and transparent coating on the chicken. Despite its thinness, the sauce still baked in well and had a nice caramelization over direct heat. 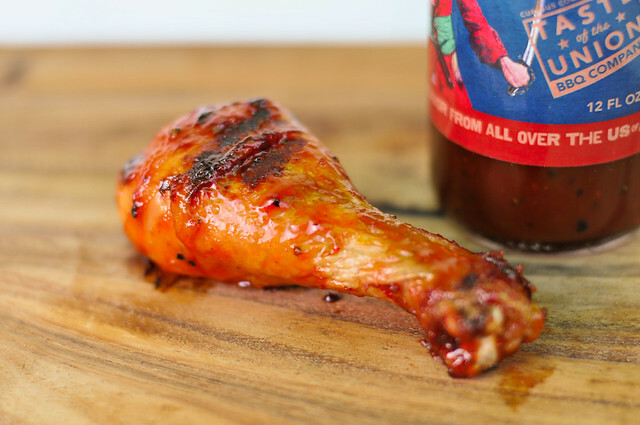 Looks should not device though, because the sauce still packed a ton of flavor into the chicken. The heat livened up the citrus even more, which the spice mellowing, giving more opportunity to enjoy the fruity sweetness of the sauce. I haven't tested any fruit based sauce yet, but as first, this one certainly sets the bar high. The bright and lively flavors given by an array of citrus fruits makes this a sauce that can add life to wide range of tasty animals. Seafood would come first to mind, where the light sauce would pair well with the delicate texture and flavor of fish. It did very well on chicken, and I'd imagine pork would be a fitting partner too. I liked this both out of the bottle and cooked, with a very slight preference to when it was cooked because the spice mellow and let you further savory all the excellent sweet and tangy fruit flavors.